The new season is under way and the Tipperary hurlers got their campaign up and running with a high intensity performance in Semple Stadium last Saturday night before an attendance of 8,217. In doing so Tipp recorded a deserved 2-16 to 1-11 victory over Clare with captain Seamus Callanan (Drom & Inch) leading by example scoring both goals and finishing up with 2-7 in total. 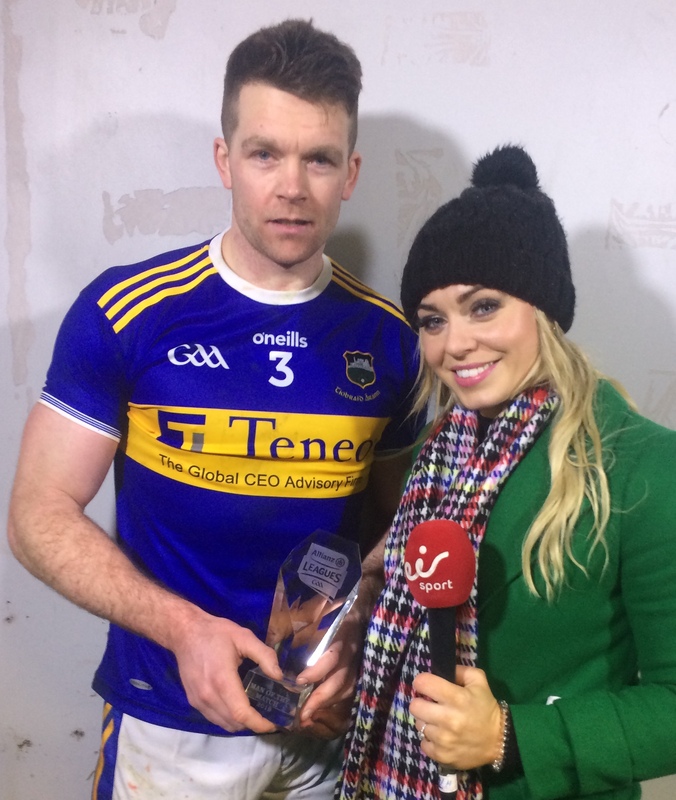 Congratulations to Padraic Maher who was the eir Sport Allianz man of the match and is pictured below receiving his award from Anna Geary. Congratulations also to Robert Byrne (Portroe) and Jake Morris (Nenagh Éire Óg) as they both made their full league debuts and also to Mark Kehoe (Kilsheelan-Kilcash) and Killian O’Dwyer (Killenaule) who were introduced in the second half. The last time the sides met in the league when Limerick were All Ireland champions was in the 1973/74 season with two meetings and honours shared. Tipp won by 1-14 to 1-13 at Semple Stadium in the group match, on February 24th, 1974 thanks to ‘Babs’ Keating’s (Ballybacon-Grange) palmed point just before full time. Limerick, however, won the subsequent semi-final at the Gaelic Grounds, on April 21st by 1-16 to 3-8. The respective attendances were 12,000 and 26,280, with Francis Loughnane (Roscrea) top scorer for Tipp on both occasions with 0-7 and 2-5. Outside of last year’s meeting in the semi-final when Limerick came through from 1B, 2010 was the last time the sides met in league rounds. As a result the last 10 meetings read as follows; 31/3/2018, at Thurles, Tipp 2-31 Limerick 1-31 aet (semi-final); 21/3/2010 at Limerick, Tipp 2-24 Limerick 0-8; 19/4/2009 at Thurles, Tipp 1-17 Limerick 1-11; 17/2/2008 at Thurles, Tipp 2-20 Limerick 2-9; 18/2/2007 at Nenagh, Limerick 2-13 Tipp 0-16; 19/2/2006, at Limerick, Tipp 2-15 Limerick 2-15; 27/2/2005, at Limerick, Tipp 4-14 Limerick 3-11; 29/2/2004, at Limerick, Tipp 2-21 Limerick 1-12; 8/3/2003, at Thurles, Tipp 1-17 Limerick 1-8 and lastly for now 10/3/2002 at Thurles, Limerick 2-13 Tipp 1-12. Unfortunately, a below par performance in Páirc Tailteann, saw the Tipperary footballers come away from the Navan venue empty handed as Meath took the points in a 0-15 to 1-8 victory. Tipp seriously hindered with injuries introduced fresh blood into the side and congratulations to Daire Brennan (Kilsheelan-Kilcash) and Dan O’Meara (Kiladangan) on their Allianz league debuts. Fermanagh travel to the Field of Legends for round 2. In their opening match Fermanagh drew with Cork 0-8 to 1-5 at home. Last week saw the arrival of the much-anticipated new Tipperary inter-county jersey which was launched on Friday. 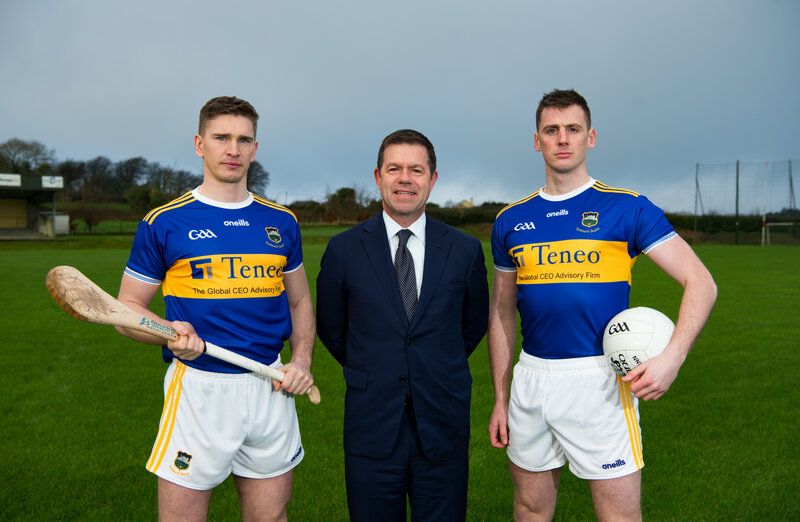 Pictured below is Declan Kelly, CEO & Chairman, Teneo, Tipperary hurler Brendan Maher and Tipperary footballer Conor Sweeney who were at Portroe GAA Club to unveil the new look Tipperary jersey that will be worn by the county’s teams from minor through to senior level in 2019. The Global CEO advisory firm was recently announced as the new sponsor of Tipperary GAA. Photograph courtesy Teneo/Sportsfile. 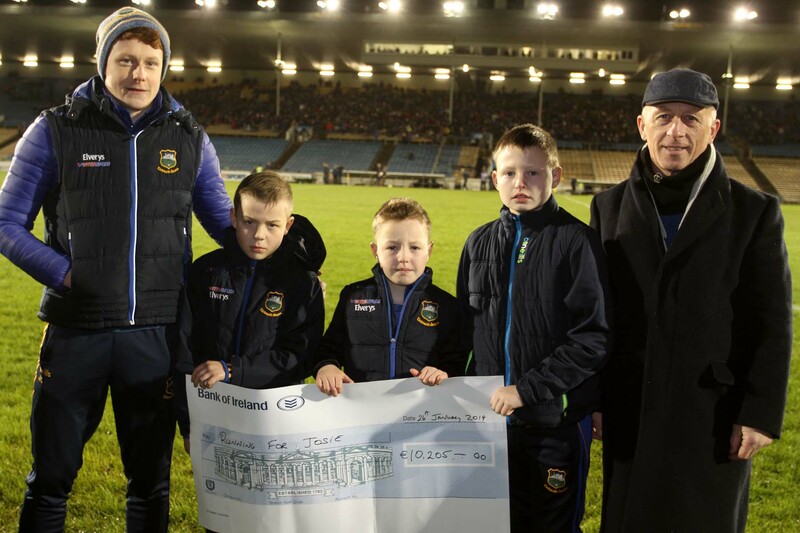 Following on from the tremendous success of the Tipperary hurling panel’s fundraiser efforts in aid of the ‘Running for Josie’ project and Amanda Stapleton Benefit Fund, Brendan Maher and Jerome Cahill on behalf of the panel presented the proceeds at half time in the Allianz league match last Saturday night. In raising the huge sum of €20,410 in the one-day event, both benefit projects received €10,205 each. 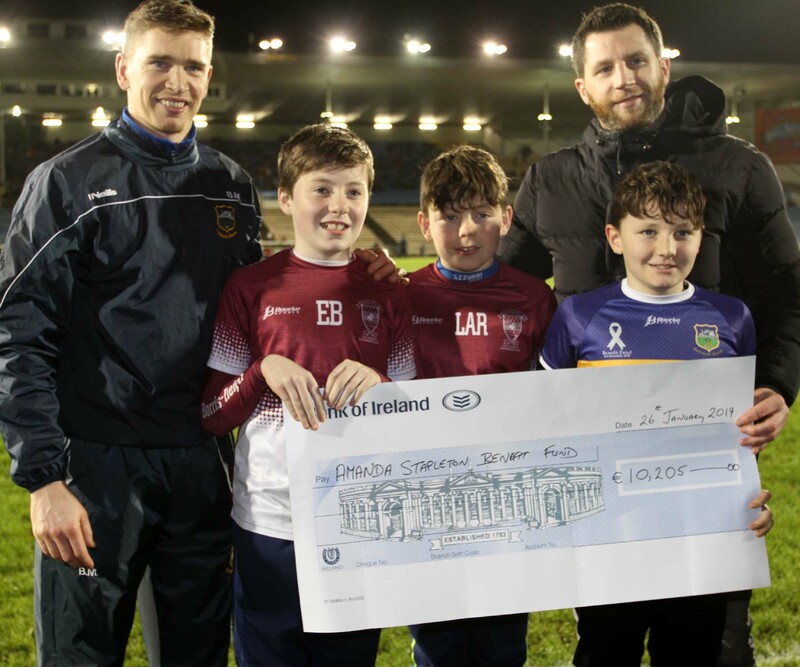 Pictured below is Brendan Maher presenting Shane Stapleton with a cheque accompanied by Borris-Ileigh juveniles Eoin Boyle, Lar Stapleton and Eamonn Groome. Next Kilruane MacDonaghs juveniles Senan O’Leary, Colin Gaynor and Dara Gaynor joined Jerome Cahill as he presented Seamus Hennessy Snr. with the share of the proceeds for the Running for Josie fund. Congratulations to Ger Ryan (Templederry Kenyons) left, who was elected as Vice-Chairman of Munster Council last Friday night. This is a wonderful honour for Ger, his family and club and indeed the county. 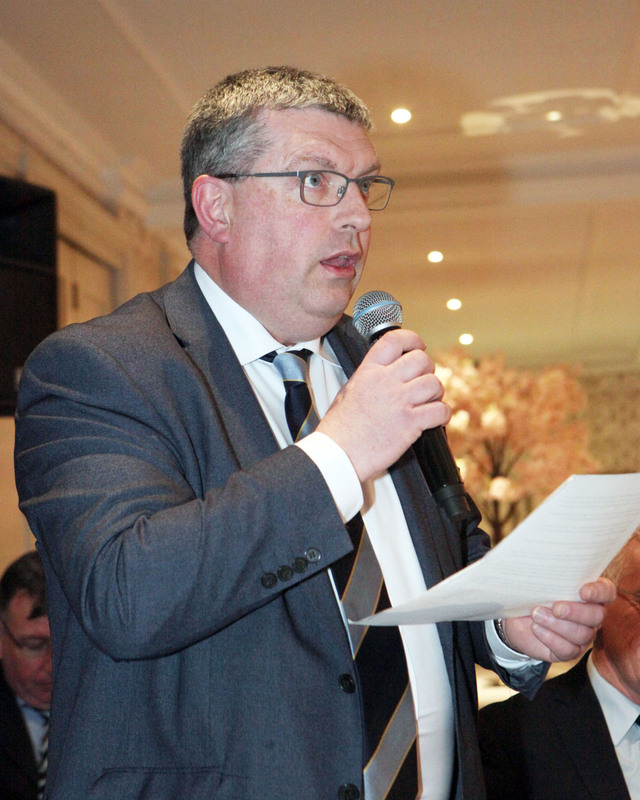 Ger served as Tipperary Co. Board PRO following his tenure as chairman of Tipperary Supporters Club. Following his stint as county pro, Ger went forward and served the Munster province as PRO with equal distinction for a three-year term. 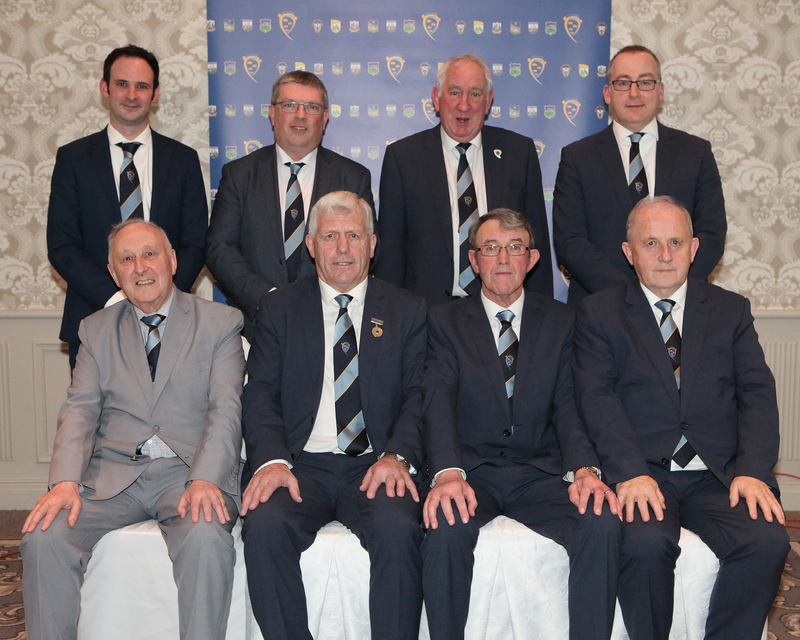 Currently Ger is Munster delegate for Tipperary and will relinquish that position now that he is vice chairman. Ger has also worked on many committees in Croke Park some of which he has served as chairperson. Ger is pictured below with his family and Tipperary delegates at the convention. 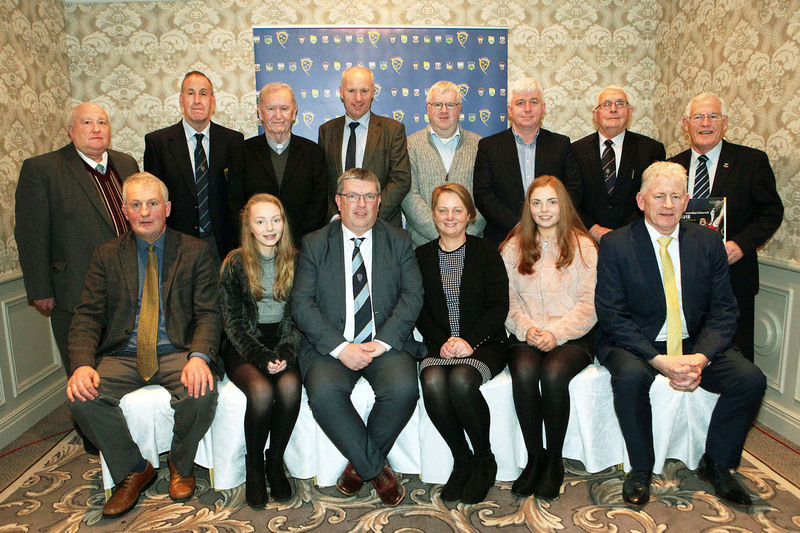 Tipperary Group at the 2019 Munster GAA Convention held on Friday January 25th in the Devon Inn, Templeglantine, County Limerick. There was more positive news on Monday in the Corn Risteard Ui Mhathuna 19 C hurling semi-final, as Borrisokane C.C. reached the final following a 3-17 to 2-8 defeat of Coláiste An Phiarsaigh Glanmire. Best wishes to Borrisokane C.C. who will now play St. Anne’s Community College Killaloe in the final. Students should immediately book a course directly from one of the three nominated Munster Irish Colleges on the application Form. This should be done ASAP as popular dates are booked out quickly. Students wishing to secure a scholarship from Tipperary GAA should complete the attached application form and submit it through their own local GAA Club. The secretary of the GAA Club must sign the form and attach a reference letter supporting the applicant’s application before returning it to the Co Rúnaí. Please note the club recommending the successful applicant will be contributing €75 to the scholarship along with the Division, Co Board and Munster Council. Interviews for the scholarships will be held in Lár na Páirce during February to establish each candidate’s suitability. Once the student is notified that they have been successful they must secure a receipt for their fee payment from the Irish College where they have registered. Once this receipt is received by the Co Rúnaí the scholarship cheque for €300 will be posted out directly to the student’s home. In Group A, UCC made it two wins out of two, to reach the quarter-finals when defeating UCD 2-21 to 1-13 in the Mardyke. Mark Kehoe (Kilsheelan-Kilcash) was in great form scoring 1-4 for UCC with Killian O’Dwyer (Killenaule)and Paddy Cadell (JK Brackens) both introduced in the second half. For UCD Brian Hogan (Lorrha-Dorrha) and Michael Purcell (Thurles Sarsfields) both started with Hogan scoring 1-1 from placed balls while Purcell scored 0-1 from play. His brother Rory joined proceedings in the second half and he too scored 0-1 from play. Stephen Quirke (Moyle Rovers) was another introduced for UCD. There were also two games in Group B and first up the tie which saw Limerick IT also progressing to the quarter-finals when seeing off the Garda College 4-24 to 0-12. Rian Doody (Cappawhite) with 0-3 right and Robert Byrnes (Portroe) with 0-2 were also joined on the starting fifteen for LIT by Sean Ryan (Sean Treacy’s). For Garda, Kevin Slattery (Gortnahoe-Glengoole) was again among the scorers with 0-2 (1f) while Joey O’Keeffe (Clonoulty-Rossmore) and Aidan Ryan (Thurles Sarsfields) were again in the inside back line. Michael Brislane (Toomevara) saw his first taste of action this year when introduced in the second half. The ball can bounce twice before being returned. Serve must strike front wall first and pass the short line before bouncing. Goggles must be worn (Will be provided on the day if required). All matches are 8 minutes- whoever is leading at this stage wins. Final is up to 15 points. As stated above closing date for entries is Thursday January 31st. Entries to be submitted to Andy Ryan GDA via text or email 087 9090985andy.ryan.gda.tipperary@gaa.ie After the closing date a draw will be made and entrants will be emailed or text exact match timetable. Any further queries contact Andy Ryan. This year’s Hurlball Tournament will be sponsored by Stakelums Office Supplies, Thurles.